Panasonic at CES 2014 | What Hi-Fi? Panasonic had plenty of new announcements in its CES 2014 press conference, and so we took a tour of the Panasonic booth to get a closer look at them all. 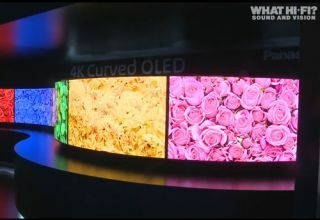 4K was a big theme for a lot of manufacturers at CES 2014 and Panasonic’s booth was no different. Showcasing their new 4K range, the TC-AX800U, it features Panasonic’s new Studio Master colour technology, offering much brighter colours and better gradiation compared to last year’s sets. It will be available in 58in and 65in and available around April. We also got a sneak peek at a new 4K TV prototype – a direct lit LED panel, which was put up against last year’s excellent ZT60 plasma model. The idea was to show Panasonic really is working to make their promise of offering plasma picture quality using LED technology a reality. We can’t wait to get our hands on this one. Also on show was their new smart TV system. Last year’s My Home Screen will remain, but it is joined by two new features. The first is My Stream, a recommendation system that learns the programmes you like and offers up a selection of suitable content, from TV and on demand, when you turn the TV on. You can help the TV’s selections to be as accurate as possible by ‘liking’ programmes you enjoy using a button on the remote. Voice activation has been improved too, and is now able to recognise voices to load relevant content for that particular user. Info Bar is the second addition to smart TV, and is able to sense when people walk into the room using heat sensing technology. It will then wake the TV with relevant information for the user, such as time and weather, plus face recognition means it can also load My Stream content and personal video messages, which can be sent to the TV via the Viera app. It wasn't all about TVs though, and Panasonic also announced its movement into the multiroom audio market, with the portable SC-ALL3 and larger SC-ALL8 speakers and the SH-ALL1C network audio connector to connect to an existing system. The speakers use an AirPlay-rvialling technology called Qualcomm AllPlay, and really look the part of the premium multiroom solution, with their metal and leather design. Elsewhere on the stand we got to see the new Blu-ray players range, the top player offering 4K upscaling technology, as well as a new larger soundbase to accomodate larger TVs and three new soundbars with wireless subs. We're looking forward to getting our hands on all of Panasonic's new kit - we'll be bringing you full reviews as soon as we can.